If you’re planning to buy a new Chrysler vehicle, you can do so with the knowledge that the Mopar® Vehicle Protection Road Hazard Tire and Wheel Coverage plan is there to help you navigate along life’s difficult roads. The staff of Sterling Chrysler Dodge Jeep Ram are experts when it comes to all matters related to Chrysler vehicles, and we’re here to tell you how this protection plan can benefit you. Having Mopar® Vehicle Protection Road Hazard Tire and Wheel Coverage means that you won’t be faced with a bill if you experience a close encounter with a pothole or damaged curb. 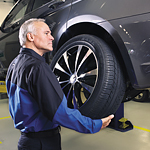 The program pays all the repair or replacement costs for up to four tires and even covers damage to the sensitive tire pressure sensor gauges. Vehicles that are up to 10 years old are eligible for coverage. As a plan subscriber, you won’t pay any deductible for repairs, and you’ll get to take advantage of free towing as well.